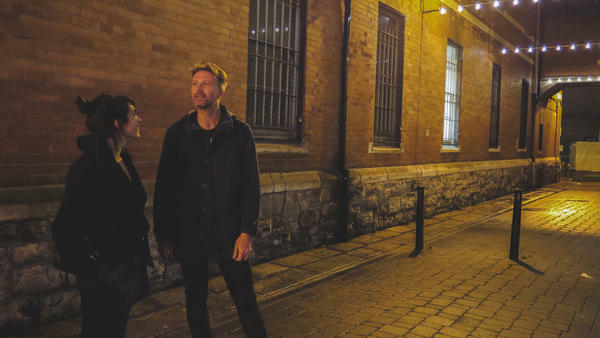 Bell X1's Paul Noonan and World Cafe host Talia Schlanger stand outside of Pablo Picante's where The Dublin Arts Club once stood. We started off on Clarendon Market where the Dublin Arts Center, the spot where Bell X1 played some of their earliest shows, once stood. It's not a venue anymore, but we still heard a woman playing the piano and singing from outside a music school. Paul reminisced about the moment when he realized it wasn't just Bell X1's family and friends in the audience anymore. We made a pilgrimage to the famous venue Whelan's to find Paul's photo on the wall of artist alumni. And then Paul took us to a house he used to share with friends in Smithfield. It's right across from the Capuchin Day Centre For Homeless People and Paul remembers passing long lines of people waiting for food in the mornings. That's where he met Rocky, a man who would sleep on a wooden pallet outside Paul's window. One morning, Paul saw Rocky snuggled with a lady friend and was inspired to write the song "Rocky Took A Lover." Come along to hear the whole story.